Lion dance is a traditional dance in Chinese culture where dancers perform in a lion costume to mimic the movements and behaviours a lion. 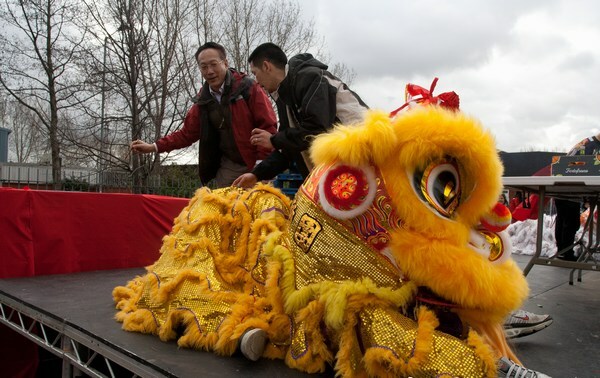 Variations of the lion dance can be found in many other Asian countries, including Korea, Japan and Vietnam. 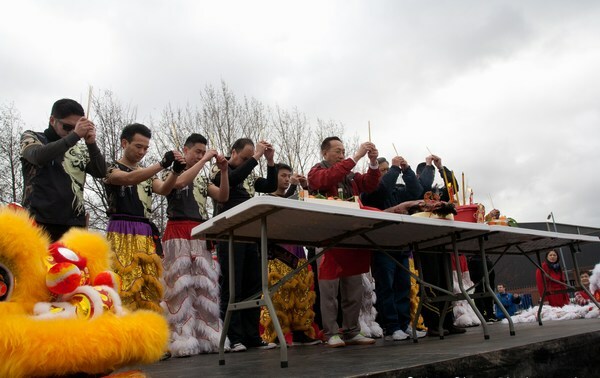 There are two main types of Chinese Lion Dance – Northern Style and Southern Style. Northern style lions resemble fu-dogs a lot more, and have a more acrobatic and playful theatre about them. The Southern Lion originates from Guandong where there were many famous kung fu schools, and therefore has strong ties to Chinese martial arts. 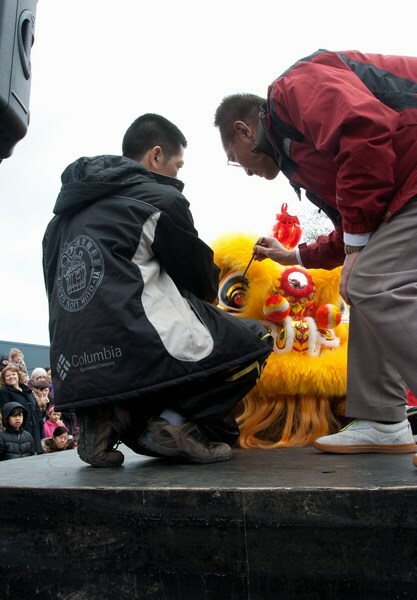 Only the best martial artists of a given school would be given the honour of performing the lion dance in public. The reason why many Chinese people like to light firecrackers and perform the noisy lion dance at Chinese New Year is to scare away the Nian monster and to give us luck for the coming year. 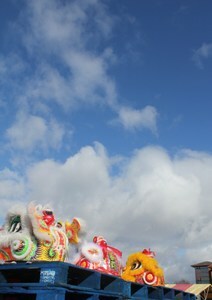 During their dance, lions will often perform the traditional custom of 採青 (choi cheng). This means ‘to pluck the greens’. The family or business inviting the lion to perform will provide a red envelope along with a bundle of vegetables which the lions will eat. Unfortunately, lions don’t like vegetables, so they will spit it all back out! But remember, if you get hit by some lettuce, you will have good luck for the year! When you have a brand new lion dance costume, before their first performance, they must be awakened. A lion-awakening ritual is required! Offerings for the 天神 (teen sun) must be laid out. This is the Sky God. 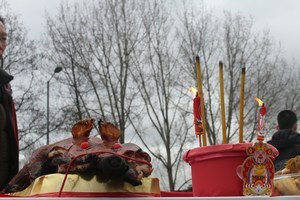 Offerings take the shape of foods such as a roast suckling pig, a whole poached chicken, fruits and other sweets. Two candles are lit so that the sky god might see the offering. Prayers are made with incense and the Sky God is asked for his blessing for the new lions, to ensure they awake lively and energetic. After this, 點睛 (deem jing) occurs. This involves dotting paint onto the lions as a symbol of life-giving. Dot the eyes, so that the lion can see. Dot the nose so that it can smell. Dot the mouth so that the lion can eat, and dot the ears so that they can hear the beat of the drum! Finally dot the lion all down their body, to ensure that it is brought to life from head to tail. The lion has been brought to life!